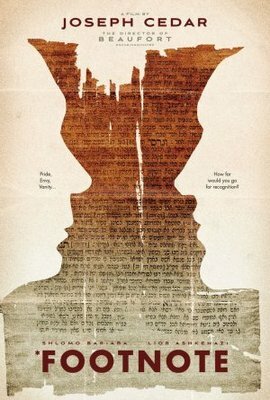 The critically acclaimed Footnote is an intriguing Israeli drama written and directed by Joseph Cedar, who is best known for the war drama Beaufort. It originally premièred at the 2011 Cannes Film Festival, where it received a Best Screenplay Award. Footnote was also the recipient of nine Ophir Awards, including Best Film and was also nominated for a Best Foreign Film Academy Award earlier this year (the stunning A Separation went on to win the award). Footnote is centred on the professional rivalry between a father, Eliezer Shkolnik, played by Shlomo Bar Aba, and son, Uriel Shkolnik, played by Lior Ashkenazi. Both Eliezer and Uriel are professors at the Talmudic Research department of the Hebrew University of Jerusalem. Eliezer is a bitter old man, who is jealous of his son's academic success and popularity within the university. For many years, Eliezer has hoped to be awarded the Israel Prize - the state's highest honour. Unexpectedly Eliezer receives a phone call from the Minister of Education one nondescript afternoon and it 'appears' he finally will receive what he has always wanted - the Israel Prize. The next day, Uriel is informed that the Israel Prize was meant to be awarded to him and not his father - the Minister of Education only referred to Eliezer as 'Mr. Shkolnik' and mistakenly believed she was speaking with his son. The revelation forces Uriel to choose between his father's happiness and his own professional success. Footnote is a clever film with the unexpected comedic moments and Cedar livens the academic world through the use of visual effects. This is an ambitious film which features fantastic performances from both Shlomo Bar Aba and Lior Ashkenazi, who create quite complex characters. The final scenes have been widely discussed by many film critics and while some audience members may feel unsatisfied - the film is certainly enjoyable.